Is it difficult for you to remember all the inputs and outputs associated with the tasks defined in the BABOK? 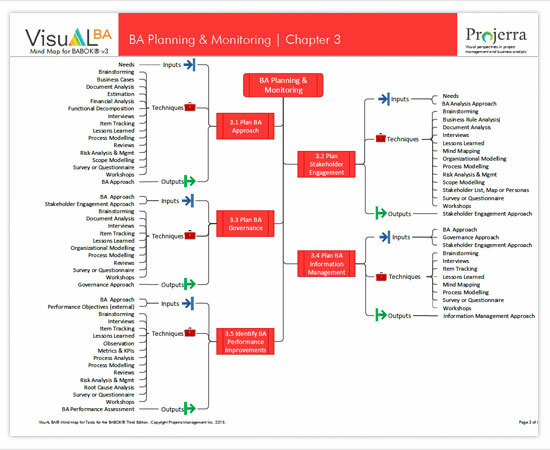 Projerra is happy to announce the second in a line of products intended for the aspiring business analysis: VisuAL BA® Mind Map for Tasks (for the BABOK® Third Edition). The use of color, icons, and associations in VisuAL BA® Mind Map for Tasks will help you visualize the relationships between the inputs, outputs, and techniques. The mind map will make it easier to memorize all the details to pass the exam CBAP® or CCBA® exam.